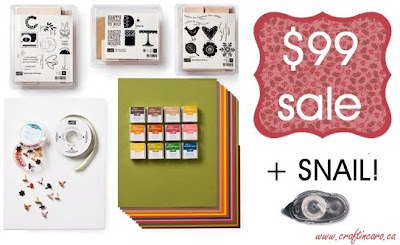 Craftin' Caro: Ultimate Stampers Bundle -- What a deal! Ultimate Stampers Bundle -- What a deal! Want a bunch of stamping supplies but don't know where to start? Maybe you would like to put together a fabulous beginners package as a gift? I've got my very own specially priced Ultimate Stampers' Starter Bundle right here! Catalogue Price for all of this would be $180.70 -- but MY bloggers special price for you -- only $99! This special offer ends November 30th but is only WHILE SUPPLIES LAST! To order, you must either call (416-694-4074 or 1-866-694-4074) or email me to get this price.... the online ordering system does NOT accept personalized discounted deals.